I love pancakes and you will find many variations on my site! Dark Mayan chocolate has traditional dark chocolate flavor along with some hints of cinnamon. Pureeing the apples adds a nice sponginess and moisture to the pancake and the little pieces of apple really adds a nice texture. 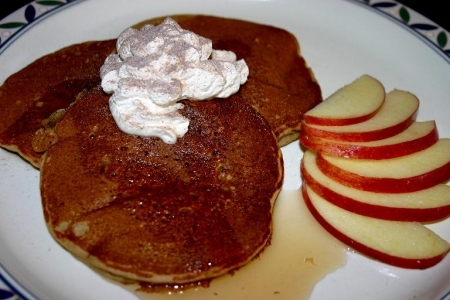 If you like this recipe, try my Mexican Chocolate Apple Pancakes. Yields 12-15 pancakes. Peel, core and cut apple in half. Cut half of the apple into small pieces and puree the other half. Pour into a large mixing bowl. Add milk, eggs, brown sugar, dark Mayan chocolate, vanilla, baking soda and baking powder. Whisk together until fluffy. Add flour. Mix until blended. Do not over mix or pancakes will be tough. Add diced apples, mix gently well combined. Test griddle/skillet with a drop of water to make sure it is hot enough. It should sizzle and that means the griddle/skillet is hot enough. Ladle dough onto your griddle or hot skillet. Wait for inverted bubbles to appear on pancakes. Check the underside to make sure they are light golden brown and then flip. Remove once second side is golden brown. Repeat for remaining pancakes. Garnish with syrup, whipped cream, additional apples and a sprinkle of dark Mayan chocolate.